The Lucia No. 3 is like a massage for the brain. The Lucia N°3 is a computer controlled stroboscopic lamp with 8 LED lights and 1 halogen light in the center. It is therapeutic light experience capable of putting the “Light Traveler” in various states, such as deep relaxation, meditative or dreamlike states and various transcendental experiences. The Lucia N°03 provides a deep nervous system relaxation while simultaneously providing a unique transcendental visual meditation experience. Light Travelers experience a state of deep relaxation coupled with focus, where one is in touch with their own intuition and sense of wholeness. It is being used in therapeutic settings as well as in research environments relating to entheogenic perceived near-death experiences or of out body experiences. Lucia N°03 uses pulsed, white LED lights in adjustable frequencies and intensities alongside a constant light source which can also be varied from dim to bright. White light passes through closed eyelids, past the retina to the pineal gland, and creates a visual experience of one’s own design, or NeuroArt. Lucia N°03 stimulates the pineal gland, which gets very excited with the lights and their differing rhythms and intensities, along with the music. This results in the colorful and swirling visionary reactions that differ with each individual, you become the artist. The inner consciousness of the Traveler produces scenes of indescribable beauty. Music enhances the experience as the mind combines the two stimuli, generating synesthesia – the experience of seeing music. Just like tones which through their sequence are experienced as music, the sequences of pulsed light with the constant light of Lucia N°03 create an overall experience that can be described as an optical counterpart to music. 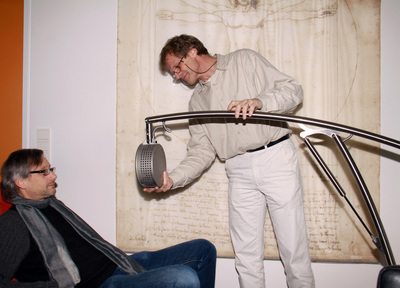 Austrian clinical psychologist Dr. Engelbert Winkler and his research partner, neurologist Dr. Dirk Proeckl first developed the Lucia N°03 Hypnagogic Light device arising out of research into Near-Death Experiences and the realization of the health and psychological benefits that often were a result of such experiences. While looking at ways of replicating the benefits of the NDE, they hit on the idea of simulating one of the key motifs of the experience – interaction with light – and developed Lucia as a means of stimulating the brain via an external stroboscopic light source. The resulting EEG brain-wave patterns and mental states have been shown to be equivalents of the measured reactions of subjects who are meditation practitioners of many years’ experience. Dr. Proeckl and Dr. Winkler managed to analyze the age-old active principle of shamanic traditions, including the healing and mystery cults, and optimized it by using modern technology. We live in a world in which we exhaust ourselves through goal-oriented behavior. Sometimes the best solution is to simply live in the moment and let go. The Hypnagogic Light Experience, induced by Lucia N°03, is a contemporary approach which allows the immersion into this alternate state of consciousness.